Think libraries are a thing of the past? Think again! 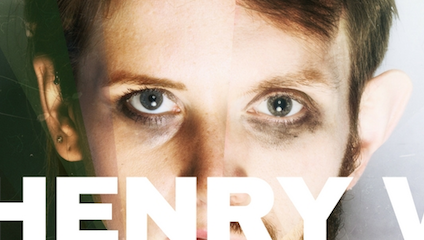 Librarian Theatre are here to convince you otherwise with their brand new version of Henry V, that’s being performed in 10 libraries around Bristol this July as part of Bristol Shakespeare Festival. We chatted to Director and performer Kelly Eva May ahead of the tour about how libraries are houses of stories, multi-roling and gender swapping, and the mammoth task of condensing a 3 hour Shakespeare play into a 1-hour accessible adaptation. Culture Calling: Your theatre company specialises in turning libraries into temporary theatres. What is it about libraries that you think makes them suitable for dramatic performance? Kelly Eva May: When you find yourself watching a play, or anything actually, in a library you realise how much you become a part of that library. Library spaces are houses of stories, so when you’re in that setting together with other audience members, and sharing an experience with the performers, it’s like you’re bringing those stories to life. You’re not just passively reading or watching something on TV, you’re actually in a building with thousands of other stories around you – I find that really fascinating. But also, libraries are community spaces, where we are encouraged to use our imagination, where children can read books about adults, and adults can be children again. We can lose ourselves amidst the library shelves, just like we can lose ourselves in a play – so there are so many beautiful parallels between reading in a library and making theatre for library spaces. CC: Are there any challenges performing in this non-traditional setting? KEM: There can be, depending on what show we’re doing, how much set we have, how many cast members and how many props. Sometimes we’re squeezed into tiny little corners and we have to make that work, so we try to make our shows as flexible and accommodating as possible! Every library we go into is totally different; the carpet, the floors, the lights, the librarians, but also the atmosphere and character. It’s not like walking into a theatre where there’s a distinct auditorium and stage area. When you are performing in a library the audience are very much part of the action, so we try to make our shows really immersive. CC: Your shows are all family-friendly, how do you approach making Shakespeare – which is often viewed as inaccessible – suitable for all the family? KEM: A big part of what we do as a company is to try and make theatre in general accessible, whether that’s having low ticket prices, or reaching areas of high deprivation or low access for the arts. And another part of our remit is making the shows themselves accessible. We have worked a lot with gender swapping, we did a show of Hamlet where the actor playing Hamlet was female. Especially when we’re in schools with young, curious audiences, it’s great to be able to open a conversation with them about why it’s important to see women on stage playing strong, traditionally male roles. To see how inspired young girls – and boys – are to see that they are growing up in a world that is more equal is really great. CC: You’ve condensed your upcoming version of Henry V into a one-hour version. How do you go about making decisions about what to edit out of what some may view as an untouchable script? KEM: It’s such a long play, it’s nearly three hours long, but all of the text is so rich. So we have to really find what best tells the story to a contemporary audience. We want to find the most relevant information and portray that. Rather than using a whole page to try and portray a message, we try to do it in a couple of lines, and back it up with strong visuals and our physicality. CC: But you’ve kept the “Once more unto the breach” speech intact. Why was this important for you? KEM: There’s a risk when editing Shakespeare, that Shakespeare lovers will find that you’ve butchered the script, which we don’t want to do. So I think those really juicy, emotion and image fuelled speeches are really important. It’s a great speech with so much in it that we as a contemporary society can relate to, there’s gritty politics like we see in the news every day, there’s reference to war… It’s great to be able to bring those images to people without having a Hollywood budget, but just by encouraging people to use their imaginations by firing up their senses. CC: There’s only two of you portraying all the characters! How do you make this work? KEM: In terms of learning lines, it’s a big feat! We’re working on that in rehearsals at the moment. What we’ve done is we’ve split the characters, so one performer plays Henry, and the other plays everyone else. There’s a lot of hat swapping and a funny physicality that comes with all the character changing, and the audience will be able to see the inner clockwork of the play. But the twist with this play is that on the night, it will be the audience who decides who is playing Henry, and who plays the all the other parts. So both actors learn every role, and will swap depending on the decision. We also have a musician playing live on stage, who will be creating a live score with loop pedals, guitars, trumpets and drums – we’ve got loads of things going on. So hopefully it will be a really fast paced, heightened, energetic and entertaining piece of art that we can bring into these libraries in Bristol. CC: Do you have a favourite character to play? KEM: Well of course Henry is quite something to play, and all of his really juicy monologues are great to deliver. There are also a couple of minor characters that are very funny. There’s a scene between Catherine and Alice, who are two French women, and it’s a bit of light relief after quite a few gory bloody war scenes, long speeches and images of death. These two characters are trying to learn English. There’s a lot of misunderstanding and not quite being able to pick up the language. It’s done in a really tasteful way, and I can really empathise with it, because when you are trying to learn a new language it can be quite comical. KEM: All of our shows have been slightly interactive. It’s quite nice to break down the barrier between the audience and performer. Sometimes we use empty chairs so the actors can sit down among the audience. This show is in the round, so the audience will be on all sides and we’ll be able to walk all around them, behind and through them… and maybe at some points we might be sitting on the audience’s laps. We do have a moment – I’m not going to tell you when, you’ll have to come and see – where we will be bringing up a few audience members to take part in the show. It’s all good fun, we’re not throwing lines at people. It’s all in good humour, and when there’s dads and daughters and friends coming up, it gives it a real feeling of community and everyone working together. Just because you’re the audience doesn’t mean you just have to sit there passively for an hour, it means you have to stay on your toes, and really have to listen to what we’re saying… because any minute we may be picking you out of the audience. CC: The future of local libraries is currently uncertain, Bristol City Council announced cuts of £1.4million to the libraries budget last year. Why do you think libraries are important community spaces and how do you think performances such as yours are helping to preserve these local venues? KEM: It gives me shivers when I think about the future, if we don’t do anything about the state of affairs in reference to libraries. Libraries are the last place we have in our society where you don’t have to be a consumer, you can go in and be safe and warm, using the internet, read, speak to librarians and other people, without having to buy a coffee or a meal. In an age where people are becoming much more isolated and lonely – which ultimately kills people because they are not being stimulated in the right way – if we take away these spaces, we’re actually taking away a life line for a lot of people. Libraries and librarians are often the first port of call for people with mental health issues and for people who need help with forms that will help them get jobs or figure out their benefits or tax returns. For us as a company, we’re able to remind people that these spaces are here, and are encouraging them to come and see the work they’re doing. Librarian Theatre’s Henry V is playing as part of Bristol Shakespeare Festival at various libraries around the city from 10 July – 20 July 2018.